All Events › FREE! Seniors (60+) Design Your Own Carnival Mask class. Create fun, decorative easy to make carnival masks followed by FREE! Caribbean themed snacks and refreshments. FREE! Seniors (60+) Design Your Own Carnival Mask class. Create fun, decorative easy to make carnival masks followed by FREE! Caribbean themed snacks and refreshments. Hello, In London, August Bank Holiday is traditionally the time of the Notting Hill Carnival, the largest street carnival in Europe! 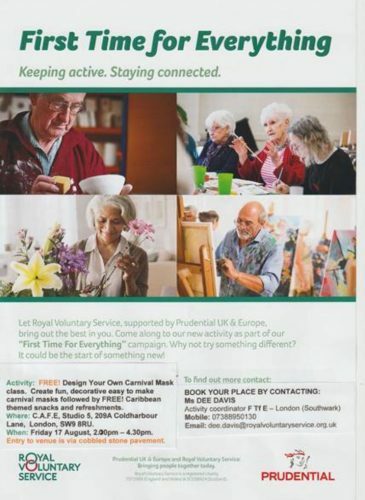 And to mark the whole Carnival experience, Royal Voluntary Service are running a Seniors Design Your Own Carnival Mask workshop for older people, 60 years upwards in partnership with the inspiring and talented people of Sunshine International Arts. Please note limited spaces available. Activity: FREE! Seniors (60+) Design Your Own Carnival Mask class. Create fun, decorative easy to make carnival masks followed by FREE! Caribbean themed snacks and refreshments. Where: C.A.F.E, Studio 5, 209A Coldharbour Lane, Brixton, London, SW9 8RU. When: Friday 17 August, 2.00pm – 4.30pm – A 1 ½ hour class and one hour for light refreshments and chat! Entry to venue is via short cobble stoned pathway.